Ultra-Dynamics has recently supplied an on-line MAGNASAT system to Project Magnet for the measurement of magnetite in the feed stock prior to crushing in high pressure rolls. 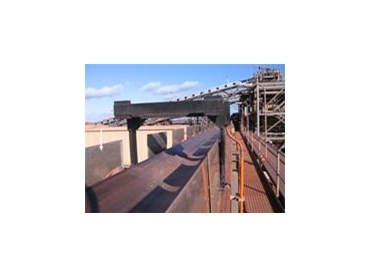 MAGNASAT will be used to control the conveyor speed depending on the level of magnetite in the feed material. MAGNASAT is being installed on a 1 meter wide conveyor with the data output to the plant DCS for control of the conveyor variable speed drive. A picture of the system can be seen below. MAGNASAT consists of; an interrogation coil which is installed round the conveyor belt; a reference coil which is located adjacent to the interrogation coil and an Electronics Control Cabinet which houses all the electronic components as well as the power supply and terminations. The interrogation coil measures the changes in the magnetic field caused by the passage of the magnetite carried by the conveyor belt. The electronics housed in the Electronics Control Cabinet manipulate the raw data so that the data is output in an appropriate format which in this case is % magnetite. The system can also be used for measuring hematite. Once the system has been installed, it has to be calibrated, which is usually carried out using an automatic sampling system if this is available. If an automatic sampling system is not available then stop belt sampling can also be used to calibrate the system.